Advance the protection of the natural ecosystems of the Tacana ancestral lands, which span 343,000 hectares in Bolivia. This program is supporting the development of a commercial Brazil nut industry among the Tacana indigenous people, which both strengthens their claim to their ancestral lands and provides badly needed income. Brazil nuts have a significant local and international market and are a natural link to conservation, since the trees only produce in a healthy rainforest ecosystem. Forest clearing in the Amazonian headwaters is an ongoing threat, against which the presence and sustainable use of the forest by local communities is a bulwark. Endemic to the Amazon basin, Brazil nut trees grow to 165 feet and have a lifespan of several hundred years. 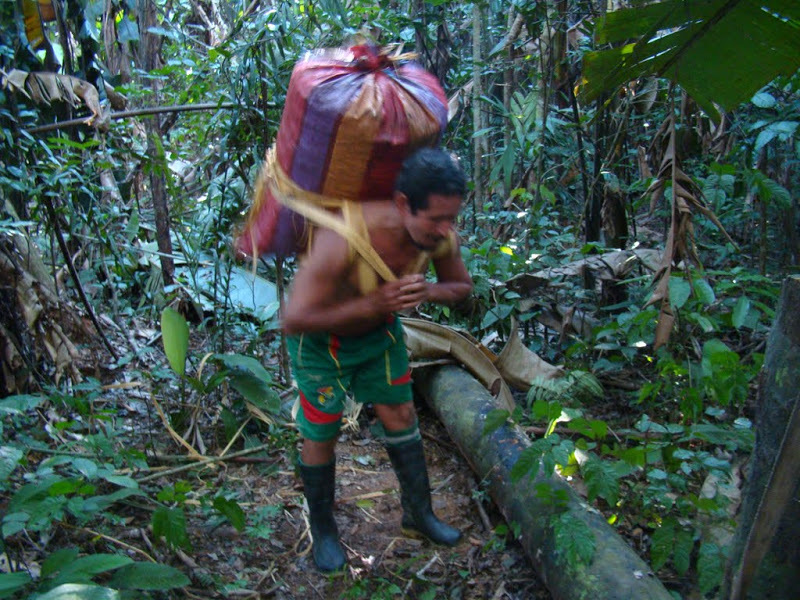 Training the Tacana in various aspects of Brazil nut harvesting and commerce. Mapping locations of Brazil nut trees to enable efficient harvesting. Help in drafting business plans and finding the best markets for the products. With $30,000, the Tacana are built 72 dryers/storage sheds that will reduce loss of Brazil nuts and improve quality, with an expected return of at least $36,000 or more a year for ten years. Our partner for this project is the Bolivian organization Asociación para la Conservación e Investigación de Ecosistemas Andino Amazónicos (ACEAA). ACEAA is a sister organization to the U.S.-based Amazon Conservation Association. ICFC became a bridge partner for this project after USAID funding abruptly ended in mid-2013 due to poltiical reasons internal to Bolivia. The search is on for support for 2014 and beyond. Brazil nuts have a significant local and international market and are a natural link to conservation, since the trees only produce in a healthy rainforest ecosystem. Endemic to the Amazon basin, these towering canopy trees grow to 165 feet and have a lifespan of several hundred years. 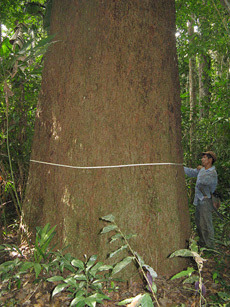 Areas of forest with dense stands of Brazil nut trees are known as castañales. Brazil nut harvesters sell the nuts to local shelling factories, which pack and export the product overseas. This extractive activity provides more than half the yearly income for thousands of families in the Amazon and protects several million acres of forest from deforestation. In Bolivia, the Tacana indigenous people are guardians of 847,306 acres (343,000 hectares) of Amazonian forest and savanna. This project continues work that develops practical conservation tools that allow Tacana communities to use their resources in a sustainable manner compatible with economic needs and to defend their ancestral lands. In this process, Brazil nut experts from Asociación para la Conservación de la Cuenca Amazónica in Peru have been sharing techniques for managing and harvesting the Brazil nut resources in the Tacana territory in Northern La Paz. The project location is in the southwestern Amazon, in the territory of the Tacana of the Madre de Dios River (made up of four villages, Las Mercedes, El Tigre, Toromonas and Puerto Perez and their communal land) in the far north of Bolivia's La Paz department. The territory is dominated (80%) by Amazonian terra firme forest with gallery forests along the river banks. Approximately 20% of the area is made up of last relic of natural Amazonian savannas known as the Pampas del Heath. This project is aimed at furthering the protection of the natural ecosystems of the Tacana ancestral lands, which span 343,000 hectares in Bolivia. Strengthen the organizational structure of the Tacana indigenous communities of the Madre de Dios River and their recently-created central organization, CITRMD, through training and technical support to improve the management of Brazil nuts and other complementary non-timber forest products and to draw up business plans for selling higher quality Brazil nuts to international and local buyers at improved prices. Strengthen the territorial management of the Tacana lands through analysis, mapping and planning of Brazil nut production. Monitor the sustainability of populations of wildlife species that are hunted by the Tacana to help ensure that no species is being over-hunted (Tacana have the constitutional right as indigenous peoples to carry out subsistence hunting). Improve the infrastructure for drying and storing Brazil nuts in the Tacana communities and in the Brazil nut harvesting areas in their forests as needed to meet international standards of quality. Workshops were held for organizational strengthening in Tacana communities. Workshops were held for improvement of Brazil nut management plans. Strategizing for selling Tacana Brazil nuts to national and international buyers. Updated Tacana Brazil nut maps. Analyzed production data from the 2013 harvest and forecast 2014 production. Drafted Brazil nut business plans for Tacana communities. Oversaw self-monitoring of hunting by the Tacana communities. Held meetings with Tacana Representatives to develop construction plans for storage areas and dryers. Purchased materials and constructed or upgraded Brazil nut collection centers.